Looking for new job … and country? You are at:Home»Australia»Looking for new job … and country? The U.S. Navy is obviously downsizing and by many accounts losing some darn good sailors in the convoluted process — all due to the ongoing economic downturn and pressure on overall defense spending. Staunch ally Great Britain is facing the same sorts of pressures and trimming its forces. Meanwhile, the military of another strong ally, Australia, is struggling to recruit enough able bodies — so much so that according to this report, the Royal Australian Navy has sent a delegation to Britain to hunt for engineers and submariners who’ve been cut from the force. One study cites a need for as many as 200 engineers — specialists being lost to private industry — and crew members for destroyers and landing ships. According to the report — spotted on the U.S. Naval Institute blog — the Aussies are looking elsewhere, too: the U.S., Canada and New Zealand. The Aussie Navy wants officers in the fields of surface warfare, submarines, engineering and medicine. 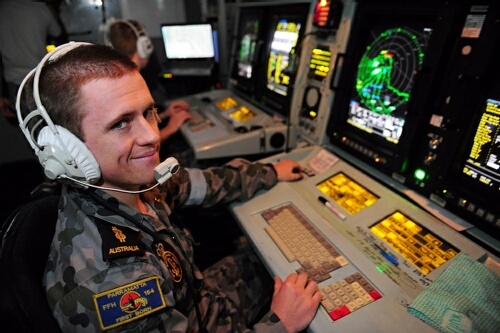 Submarine sailors are needed in Cryptologic Systems and Electronic Warfare; also needed are Marine Technicians and Electronics Technicians. Surface fleet sailors are needed in multiple areas. Check the possibilities out here. If you qualify, however, there’s a big catch: You have to apply for a permanent resident visa before traveling to Australia, and make a written promise to apply for Australian citizenship as soon as eligible. This normally takes two years but military expatriates will become eligible after three months’ service.